I haven't posted one of my tasty water recipes in a while so I thought I'd share one with you on this lovely Monday morning! These water recipes are low-to-no calories & taste great, plus they help curb the cravings for sweet drinks & sodas! 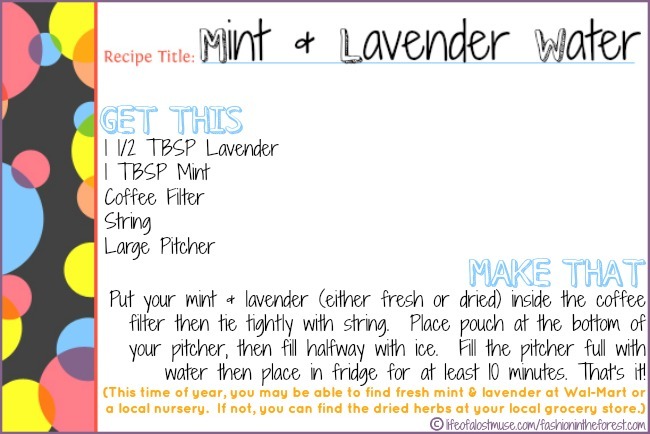 Did you know that both lavender & mint are known to soothe and upset stomach? It's true! They also aid in detoxing your system...and freshen your breath! Like many of my other recipes, you can keep reusing your ingredients until the flavor is gone. I tend to re-fill my pitcher about halfway through because I drink this so much! I've included a printable recipe card below. Just right-click & save to print it out at whatever size you like.